What is Fridge Manager on my Family Hub 2.0 refrigerator? Tap the widget on the Home screen to access the Fridge Manager. The Fridge manager is a graphical representation displaying the running condition inside your refrigerator. The top half of the display represents the fridge compartment, the bottom left the freezer compartment and the bottom right the Cool Select +. You may select the power mode (Power cool or power freeze) to speed up the cooling and the freezing process at the maximum speeds. This makes the freezer or the fridge to run at full speed for several hours and then return to the previous temperature. This feature is particularly useful if you like to cool/freezer large amounts of food, just activate the power cool/power freeze. Use the controls on the display to change the temperature according to your requirements. 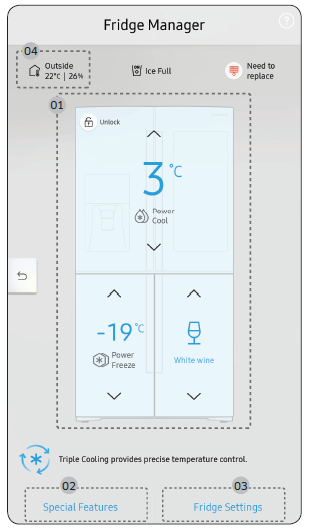 Special features, fridge settings and outside temperature are also displayed on the screen as indicated (2, 3 & 4 on the diagram). What are some of the features of Samsung Family Hub 2.0? What apps are available on the Family Hub 2.0 refrigerator?